Neil Lennon lauded Fraser Murray after the teenager delivered another eye-catching performance as much-changed Hibs edged out Raith Rovers. The 17-year-old midfielder shone on his only previous outing for the first team when he scored in an Irn-Bru Cup win over Turriff United last September. And the academy prospect was once again one of the Easter Road side’s most impressive performers as he made his league debut in a hard-fought 3-2 home victory over Rovers. 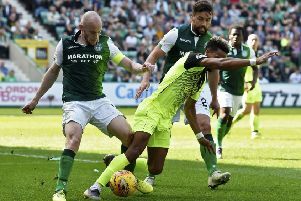 Lennon made ten changes to the side which lost to Aberdeen in the Scottish Cup semi-final last weekend as he gave game time to his fringe players and youngsters. The manager defended his decision to rest his big guns even though Rovers are vying with Dumbarton, Ayr United and St Mirren to avoid relegation. James Keatings scored a double – including a stoppage-time winner from a free-kick – as well as an assist for substitute Grant Holt’s goal on a night when winger Chris Humphrey marked his return following two months out through a combination of injury and off-field problems with an accomplished display. “I’m really pleased for Keatings,” said Lennon. “Not many can do what he did for the winner. You can tell Humphrey’s not played much lately because he tired in the second half but for an hour he was excellent. He showed real quality to pick out Keats for the first and some of the early balls he got into the box were fantastic.